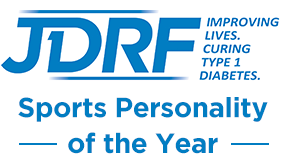 Quality in Care Awards 2015 | Life, Sport and Diabetes - An everyday look at my life with type 1 diabetes. This week I was very fortunate in having the opportunity to attend the Quality in care awards at Sanofi headquarters in Surrey. The awards ceremony was all about celebrating great care and innovation in diabetes, but it was also a wonderful chance to meet and greet some new faces within the diabetes community in the UK. One of the many things that was great about the night, was the fact that it was presented by fellow type 1 person and TV personality Dominic Littlewood, who's had the condition for 41 years. It was fascinating hearing about how far he thought diabetes treatments had progressed since his diagnosis. Dom was talking about how far behind your actual reading that the urine tests he had to do were, imagine that when you're having a hypo or are struggling with a high. But hearing these stories makes me appreciate my blood testing metre and insulin pump I can tell you! I also had the joyful surprise of meeting Magic the hypo dog, if you don't already you need to follow his adventures on Facebook because this dog goes everywhere and meets everyone! Trained to identify his owner's hypo smells and symptoms, it was brilliant getting to meet Magic who had such a cheeky and fun personality. He was very well behaved too, especially considering the hundreds of people that were at the awards ceremony! Last but not least I also got to meet the infamous fellow type 1 blogger - the Grumpy pumper! Who although characteristically grumpy, was very nice. So here I am, as I vowed to do on Twitter in the weeks leading up to the awards evening, doing my very best grumpy face (the teacher said must try harder as I got the giggles after this photo was taken!). Despite the faces we're pulling this picture, I can assure you that the Quality in Care awards evening was excellent and I look forward to telling you about how we got on in my next blog!